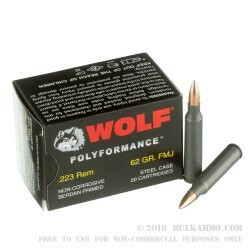 This particular Wolf ammunition is for your .223 Remington-chambered rifle. At 62 grains, these rounds possess the same weight as M855 and M855A1 NATO ammunition and are compatible with a wide range of barrel twists rates and drop-compensation reticles. 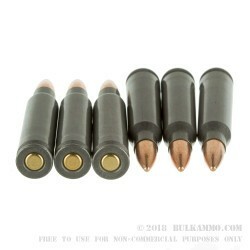 This Full Metal Jacket (FMJ) ammunition will not expand on impact and is better suited for target practice, tactical training, and plinking. 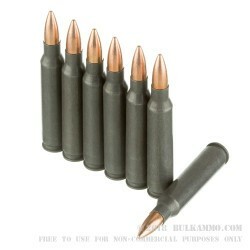 When you place your order for this single box of ammunition you get 500 target rounds. With 500 rounds you can spend extensive time honing your marksmanship skills and still have some left over for blowing away pumpkins and watermelons at your favorite outdoor spot. In order to save you money, Wolf's sources manufacture these rounds using a bimetal layering process to create steel cases. The steel cases are Berdan primed to ensure ignition and the completed rounds are coated in a polymer for moisture and rust resistance. 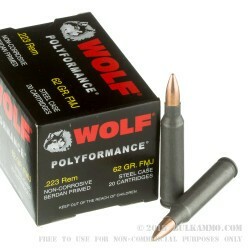 NOTE: Wolf Performance Ammunition does NOT recommend using this product with any Smith & Wesson M&P 15 rifles. See http://wolfammo.com/advisory.html for more information.